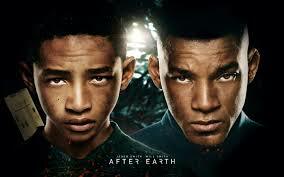 After Earth: Should have released on Sci-Fi channel instead of theaters nationwide! As a father of a thirty month old and a six month old, I seldom get to go and watch a movie in full surround sound on a widescreen with 100 other people at a movie theatre near me. So when I do, I have to make choices. I have to sit down and bet on which movie I should watch – so that I can enjoy the experience of ‘going to the movies’, come out having satisfied my insatiable cravings for good scripts, screenplays, acting and cinematography. So when it was a tossup between Star Trek, After Earth and Fast and Furious 6, I chose to place my bets on M. Night Shyamalan. After all, his ‘sixth sense’ had made me a fan of his – yearning to see him brush off his one-hit wonder tag. I was betting my sixth sense on him. Mankind has moved to Nova Prime (reminds one of Star Trek in the 80s) from Earth 1000 years ago. Its resident aliens have created a monster called Ursa which preys on humans and can see them only when they are scared (do you know we humans release pheromones when we are scared?). With that background, the film begins. Crash landing on earth, search for the beacon 100 kilometers away, running through the wilderness surrounded by animals who have learned to hate humans (when no humans existed for 1000 years), being chased by the Ursa that looks like a spider from Indiana Jones, being helped by a large bird that suddenly develops feelings for a human, wearing an advanced suit which changes color with motion but cannot protect someone from the extreme cold and using a cutlass as the main weapon to kill the Ursa (seems like missiles, automatic rifles and guns have fallen out of favor). Did I forget to mention there is a happy ending? After one hour and forty minutes, walking out of the theatre, I was angry, sad and disappointed. Angry because I had put my bet on this movie and probably should have seen Star Trek. Sad because I was watching Shyamalan attempt a movie which labels him as a “director-in-need-of-work”. Disappointed because nowhere in evidence is the gifted ‘Sixth Sense’ director who once brought intricately crafted set pieces and cinematic sleight-of-hand to his own movies. This is not a Shyamalan movie and in his defense, probably he may have not been interested in making this movie beyond the impact on his bank balance. Maybe he is saving up to float his next trademark. Every aspect of the movie leaves a serious moviegoer disappointed. Boring script, lazy cinematography, bland camera angles, poky and dull action sequences, fake CGI effects, junky sci-fi mumbo jumbo and seriously bad acting – evidence of Night’s disinterest is palpable from the first frame to the last; expect a pulse-pounding sci-fi adventure, get a lethargic slog. Jaden Smith is bad – in need for some serious acting lessons. He cannot be given the ‘Will Smith son’ or ‘a kid’ free pass. He is best running and jumping, not delivering dialogue. In a film directed by someone who presented Haley Joel Osment to the world bet there was no casting done at all – for all Night could have done was ask him to say, “I see dead people” and he would have realized what was going on. But then he never cared – this was the Smith, Inc. vehicle for Jaden. And Will Smith, the master of ‘saving the world’ has almost the same amount of screen time as the movie preview. So his biggest contribution besides writing the checks is to ensure people come to see his son. And couple that with the lack of using his charisma, charm and slick style thanks to the script – you really don’t have a Will Smith in the movie. Although the Smith franchise will recover, I seriously doubt if the Shyamalan franchise does anytime soon. The only silver lining in this one – he may not be the only one to blame.